uSocial.com - Don't buy Facebook fans or buy Twitter followers! Do you need Facebook Fans, Facebook Friends and Twitter Followers? Our new ebook tells you how to get over 1000 Facebook fans, Facebook friends and Twitter followers in a very short time - on your own! On Social Media Websites like Facebook & Twitter? Social media is the multi-cultural epicenter of online socialization, networking and word of mouth advertising. These platforms have created an online frenzy that embodies the very concept of how the web works, to connect individuals around the globe in a way that is so easy even a grandma can do it. It’s not just email or photo galleries. It’s not just personal chat and broadcasting. It’s playful, it’s business, and it’s a cultural and online phenomenon. At no other time in history has the return on investment been so consistently sweet, so easy, and so free as it is today with these seemingly simple, (almost dismissive) “social” tools. In the world of social media, friends tell friends about themselves through broadcasts, chat, messaging, and by adding links to their pages or profiles. The links found on social pages reference sports teams, funny things, items of interest, and, surprisingly, favorite companies and products. This twist in online marketing has created a whirlwind of marketing strategies that have never existed until now, and these social media networks are openly inviting companies, big and small, to cash in and interact with customers like they’ve never been able to do before. We all know that television, newspapers, magazines, billboard and other traditional media can be very expensive, yet it is a simple fact that none has proven to be as powerful or as mighty as is the word of mouth advertising that embodies the same spirit found in the top two social networking websites. In addition to the massive return that one might hope to gain from a Super Bowl advertising slot, social media costs little to nothing as it permeates and gains momentum when friends share links with each other, almost innocently endorsing your business by proudly wearing your business link on their own pages. No comments, no frills, just a, "Hey everyone, I LIKE this!" Many of you feel overwhelmed when hooking into Facebook and Twitter, especially when you're trying to promote your business. It can be daunting and very time consuming vying for fans and followers. The good news is that you don't have to focus ALL of your time and energy toward social networking sites, you only need to focus a little - if you know what you're doing - to get the results you're looking for. If used correctly, social networking increases search engine rankings and gives customers another way to locate your business. Having a social media presence adds credibility and modernizes your business. Getting a Facebook fan page and Twitter account is easy and free, but without fans and followers those pages are only a liability, as it makes you look new and unpopular! This is where uSocial.com comes in. We eliminate the need for research and focus on a very simple, streamlined approach that will help you get fans to your social pages quickly, with minimal work. With our ebook and a commitment of 15-30 minutes a day, you will have everything you need to take you from small potatoes to an online feeding frenzy. In our exclusive ebook, we give step by step instructions, and provide a daily schedule of simple tasks that will remove all the guesswork to help you achieve impressive business popularity that will get you the momentum you need. 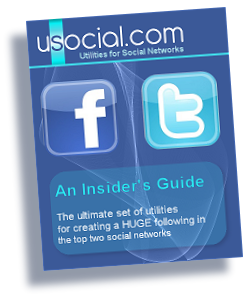 The uSocial.com eBook is the only one of its kind. It's loaded with easy-to-follow, tested examples that any business model can use. It also features indispensable utilities and resources. You'll learn the simple steps to create a massive following, including what to incorporate into your profile, your pictures, and what to write on your wall and in your tweets. Sure, kids use it, but so do adults, celebrities, business owners, and anyone who understands the basic concept of keeping in touch with a large group of individuals. However, teens don't "tweet" as much as adults do, and Facebook demographics are showing a shift in demographics to the age group of 54+. The bottom line is, this isn't just kid stuff. YES! The uSocial.com eBook will show you how. Learn how to do it yourself for only $29.99 - Order Now! There's only one package, and you can use it as many times as you like for as many sites as want. Learn how to do it yourself for only $29.99 - Order Now!